You might be thinking right now, “Demonstone? 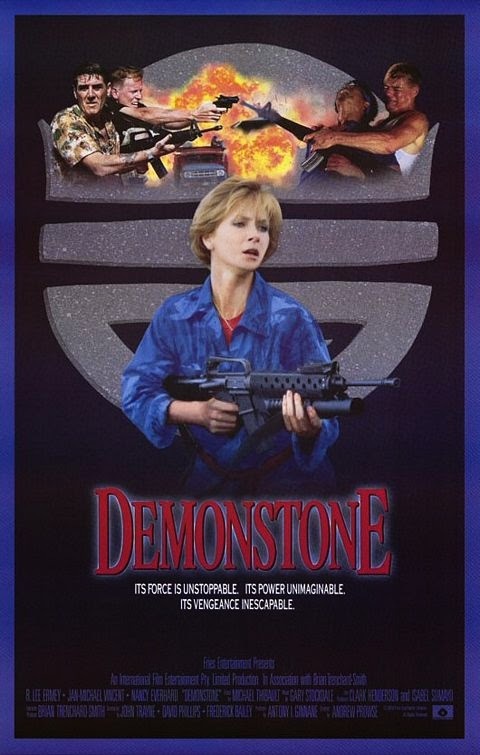 Isn’t that a horror movie?” - and that is reasonable enough to think, but Demonstone is actually an action movie. Granted, there are some horror elements and the whole thing plays out like a cross between Saigon Commandos (1988) and Soultaker (1990) with a bit of Braddock: Missing In Action III (1988) thrown in for good measure. There’s the prerequisite barfight and constant machine gun shooting. But JMV and R. Lee Ermey make a great team. While JMV’s dialogue seems a bit slurry this time around, his own hair picks up the slack. It looks cool, and gets progressively cooler in every scene. Truth be told, both his and Everhard’s hair look exactly the same. You wouldn’t be able to tell them apart if you saw them from the upper forehead up. As for Ermey, he plays a...wait for it...tough-talking Marine Colonel! Hey, better to be typecast than not cast at all. We’re actually big Ermey fans, and he does a great job. He’s as intimidating as usual here, until a shot of him walking with JMV reveals him wearing some highly ridiculous shorts. Then we felt less intimidated. Interestingly, the great Brian Trenchard-Smith is credited as a producer on Demonstone, and he featured Ermey prominently in the previous year’s The Siege of Firebase Gloria (1989). Perhaps he was so impressed with him, he opted to use him again in this project. The editor on ‘Firebase was director Prowse, who also directed Driving Force (1989). While Prowse did a good job, we can’t help but wonder what the result would have been if Trenchard-Smith (who is one of our favorites) was in the director’s chair. We appreciated that the movie was shot in - and also took place in - the Philippines. They didn’t try to pretend it was somewhere else. And actors like Gamboa and Avellana that we often see help liven things up. Surprisingly, Vic Diaz was not around for this one. In some of the protesting scenes, there are signs that say “Yankee Go Home”, among others with questionable English. You gotta love it. Maybe whoever wrote the signs also wrote the script, because there is plenty of funny dialogue on display, which actually is one of the strongest points of Demonstone. Where else will you hear someone angrily call someone else a “corndog” as an insult? While Demonstone would have been stronger if there was a specific, central villain and JMV and Ermey were cops busting heads to get to him, it’s still worthwhile, especially if you’ve enjoyed the other horror/sci-fi/action hybrids of Fries Entertainment such as Peacemaker (1990) and Steel and Lace (1991). Glad you guys reviewed this one. I was hesitant to see this one because I did think it would be a horror movie but was pleasantly surprised to see it really was an action movie. A supernatural action movie. Wasn't a bad movie (not great either) but like you guys said, Jan-Michael and R. Lee Ermey do make a great team. It was interesting and fun to see them both in a movie. And I was also put-off by Ermey's shorts. About JMV, have you seen "The Final Heist"? It's on youtube. It's not a BIG action movie but an interesting latter-day JMV flick. Totally agree, this wasn't bad at all. Solid movie. Haha about Ermey's shorts. Will have to check out The Final Heist. Thanks for dropping by, Brosnan!